I was very excited when I saw the new “Spot Slope” tool in Revit 2010. However I became disappointed very quickly. I’m not sure why Autodesk cannot create software which caters for a large amount of the countries they sell in. 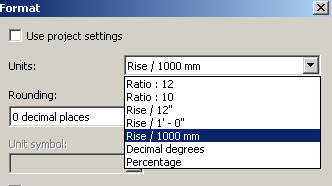 Australia, New Zealand, Britain, Ireland, Singapore, Malaysia and I’m sure other countries use the Ratio system for Ramps of 1 (rise) : Horizontal Distance Travelled. Example; in Australia the maximum rise for a disabled compliant ramp is 1:14. The spot slope tool seems to cater for all kind of different slope formula except this system of 1 : Distance. Considering ensuring ramps are compliant is such a major concern for Architects, it seems to be quite clear, Autodesk need to work on their software product development research. Come on guys, let’s get the simple things right.